The average age of deceased was 55; the youngest was just 11. Rosalind Shorty wept as they reached her husband’s name on the list. “Cynthia Asay. Benson Begay. Joan Bennion.” Volunteers on a stage in Salt Lake City’s Pioneer Park read into a microphone the names of the homeless and formerly homeless residents who died in 2017. Shorty, 55, held her candle as she sat in a wheelchair in the snow and freezing air, surrounded by dozens of volunteers, fellow homeless residents and passersby who stopped to join a vigil for the more than 117 such people who died this year. “Vernon Blackmountain.” Shorty wept. Blackmountain, Shorty’s husband, was an alcoholic, she said. He laid down and died of his disease, joining the names of many others called off at the ceremony in a corner of the park frequented by homeless people. The average age of the dead was 55. Dozens were women. Eight were veterans. Frank Gomillion was the oldest, at 86. The youngest was 11. The list was longer than at any of these vigils in the past decade. Perhaps more died on the streets. Perhaps the people dedicated to helping the homeless are better able to keep track of the dead. 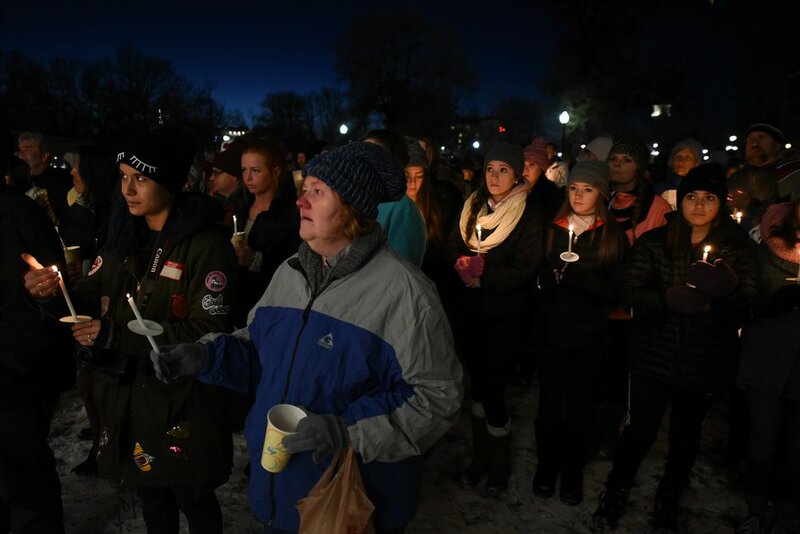 (Francisco Kjolseth | The Salt Lake Tribune) People attend a candle light vigil during the "Homeless Persons’ Memorial Day" gathering for all the homeless people who died in the past year in Utah, at Pioneer Park in Salt Lake City Thursday, Dec. 21, 2017. For years, people have gathered in remembrance of those who died, holding lit candles, praying and singing songs. This year, they met on the winter solstice, the Northern Hemisphere’s darkest day. And on that day, Gov. Gary Herbert declared Dec. 21 to be Homeless Persons’ Memorial Day. If meeting in the cold on the solstice was meant to remind those gathered that residents brave dark and constantly uncertain times, Dan Powell came to say that lives can be saved with even small efforts by regular people. His life’s story isn’t a whole lot different from some of those whose names were read Thursday night, Powell said. But opportunities and help from others helped him get sober years ago. He now works for the Inn Between, a hospice for the homeless. There were more than 2,800 homeless people in Utah in January, according to the population estimate of the Department of Housing and Urban Development released this month. That number is up slightly from 2016 and a 13 percent drop from 2010. About 10 percent of people who were counted weren’t in shelters, according to the HUD data. On Thursday night, Fred Lane remembered last Christmas, when he and a friend found a woman soaked and freezing in Pioneer Park. “She would have froze to death on Christmas Day,” he said. The men took off her shoes and socks and put her feet in front of a space heater to warm them. About 52 of those who died this year were in some form of housing after having been homeless at some point in the past, according to Laura Michalski, CEO of the Fourth Street Clinic, which provides health care for homeless people. The total numbers are up from every year since 2012, when 52 deaths were counted, according to the information from Michalski. There were 76 deaths in 2013, 71 in 2014, 92 in 2015 and 94 in 2016, according to the data. “Genevieve Blackwater. Jessica Booker. Greg A. Brewer.” The list went on. Once finished, the volunteers read off the names of those who died between last year’s vigil and the start of this year, then members of the crowd called off names that didn’t make it onto the list. “Dave Kinder,” Lane yelled. Kenneth Augustus didn’t make the list. He was a veteran staying in the Valor House and died around November, said Monte Hanks, client services director at the Fourth Street Clinic. One woman stood before the crowd and said she was homeless. She didn’t know how many people cared about the homeless, she said. Shorty, too, said she was moved that Blackmountain’s quiet death wasn’t forgotten.